Introduction: The proximal cardia region of the stomach has a high incidence of inflammation, metaplasia and neoplasia. It demonstrates less acid buffering following meals than the more distal stomach. Novel high definition pHmetry was employed to investigate acidity at the cardia under fasting conditions and in response to a meal. Methods: 15 healthy subjects were studied. A custom-made 12-electrode pH catheter was clipped at the squamocolumnar junction with four electrodes recording proximal to and eight distal to the squamocolumnar junction. The most distal pH electrode was located at the catheter tip, and nine electrodes in the region of the squamocolumnar junction were 11 mm apart. Results: The electrode situated in the cardia 5.5 mm distal to the squamocolumnar junction differed from all other intragastric electrodes during fasting in recording minimal acidity (pH <4 = 2.2%) while all other intragastric electrodes recorded high intragastric acidity (pH <4 = >39%) (p<0.05). The cardia also differed from the rest of the stomach, showing a marked increase in acidity in response to the meal (from 2.2% fasting to 58.4% at 60–70 min after the meal; p<0.05) while the electrodes distal to the cardia all showed a marked decrease in acidity (p<0.05). These changes in acidity at the cardia following the meal caused the gastric acidity to extend 10 mm closer to the squamocolumnar junction. Conclusion: Whereas the rest of the stomach shows a marked fall in acidity on ingesting a meal, the cardia paradoxically increases in acidity to become the most acidic region throughout the postprandial period. Several characteristics of the unbuffered acid pocket remain unclear and may be relevant to its potential role in disease at this site. Little is known regarding its length at different times following commencement of a meal, and there is also controversy regarding its proximity to the squamocolumnar junction throughout the postprandial period. In addition, it has been suggested that the acid pocket is merely a thin film of acid with no potential for producing significant oesophageal acid exposure.11 The lack of information regarding these issues is largely related to the limitations of methods used so far to study it. In order to address the above issues, we have developed and employed for the first time a high definition probe allowing constant and simultaneous recording of pH at 12 sites. Nine of these electrodes are in the region of the squamocolumnar junction and cardia, and spaced only 11 mm apart. The catheter is clipped to the epithelium at the squamocolumnar junction to allow accurate documentation of the pH environment in this dynamic and important region. The aims of our study were to investigate (1) the length of the acid pocket throughout the postprandial period; (2) its location relative to the squamocolumnar junction; and (3) whether the acid pocket contains sufficient acid to produce distal oesophageal acidification. The study population consisted of 15 healthy subjects (mean age 40.5 years, range 24–57, 6 male/9 female). Helicobacter pylori status was documented in all patients prior to the study by either breath test or endoscopic urease-based test, with 12 testing negative and 3 positive. The high definition 12-electrode pH catheter was placed in the upper gastrointestinal tract and endoscopically clipped to the mucosa at the squamocolumnar junction. After a 2 h rest period, the pH at each of the 12 sites was recorded at a frequency of 8 Hz. The patients then underwent pH recording during a 15 min fasting period, during ingestion of a standardised meal and during a 90 min postprandial period. The pH catheter was specifically constructed for this study (Synectics Medical, Enfield, UK). It was 2.1 mm in diameter, flexible and had 12 antimony electrodes along its distal end and an external reference electrode for application to the upper arm. The most distal pH electrode was located at the tip of the catheter and the other 11 electrodes were 30, 50, 61, 72, 83, 94, 105, 116, 127, 138 and 172 mm proximal to it. Two loops, of 3 mm diameter, were tied to the catheter using 2-0 prolene suture material (Ethicon, Somerville, New Jersey, USA). These loops were tied between the electrodes No 4 and No 5—that is, 110.5 mm proximal to the catheter tip (fig 1). Prior to nasal intubation, individual electrodes were calibrated in buffer pH 1.07 and pH 7, with data collected using Polygram Net software (Synectics Medical, Enfield, UK). Calibration at room temperature was corrected by the computer software for pH measurements at body temperature. The position of the 12-electrode pH catheter relative to the squamocolumnar junction. The catheter was clipped to the squamocolumnar junction with endoclips through a loop tied between electrodes Nos 4 and 5, 110.5 mm proximal to electrode No 12 at the catheter tip. On the day of the study, the subjects reported fasted to our gastrointestinal unit. The pH catheter was passed nasogastrically. Once the catheter was passed, the subject then underwent upper gastrointestinal endoscopy. This was performed either with xylocaine throat spray or under conscious sedation with intravenous midazolam. Under direct endoscopic vision, the prolene loop, attached to the nasogastric pH catheter, was fixed to the squamocolumnar junction using standard haemostatic metal clips (HX-600-090, Olympus), deployed by an endoscopic clip-fixing device (HX-5LR-1, Olympus). None of the healthy subjects had endoscopic evidence of columnar-lined oesophagus. The endoscope was then removed and the patient allowed to rest for 2 h following the procedure. Once the 2 h rest period was completed, the pH was measured at all 12 electrodes using the Polygram Net software for a 15 min fasting period. The subject was then fed a standardised fish and French fries meal (the patients were asked to eat until the sensation of fullness). Once the meal was completed, the pH recording continued for a further 90 min. The pH catheter was then removed with simple traction, dislodging the endoclip in the process. All subjects were studied in a semi-recumbent position on an examination couch with the headrest at 45° for the duration of both fasting and postprandial pH recording. The dynamic nature of the postprandial intragastric luminal environment was examined by subdividing the 90 min postprandial period into six consecutive 15 min intervals and the percentage time that the pH was <4 (%time pH<4) was calculated for each electrode. The difference between the %time pH<4 in the first 15 min after the meal and subsequent postprandial 15 min intervals (15–30 min, 30–45 min, 45–60 min, 60–75 min and 75–90 min) was calculated in each subject and median differences for the whole group determined. 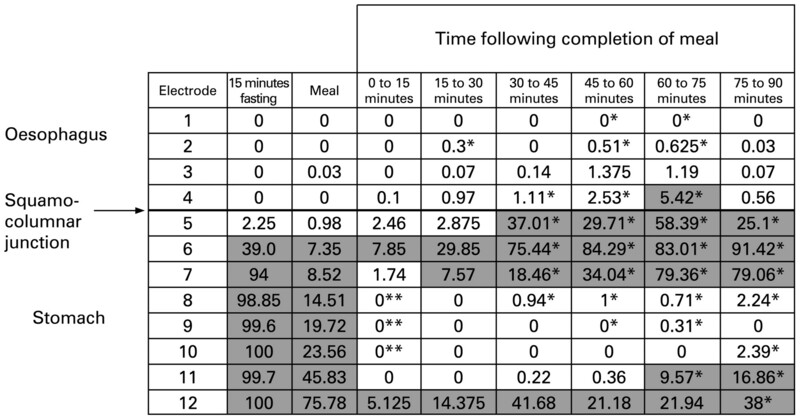 The %time pH<4 for the 15 min immediately prior to meal ingestion was also calculated for each electrode in each subject to allow direct comparison with the six consecutive postprandial 15 min intervals and the total 90 min postprandial period. Gastro-oesophageal reflux events in the postprandial period were defined as a fall in pH to <4 in one or more of the three most proximal oesophageal electrodes (at least 16.5 mm above the squamocolumnar junction). Simultaneous intragastric pH measured in the more distal catheter electrodes during the episodes of acidic reflux was also noted. A reflux event was defined as attributable only to the proximal acid pocket if (1) the pH recorded simultaneously in one of the three most proximal intragastric electrodes (electrode Nos 5, 6 and 7; ie, within 2.75 cm of the squamocolumnar junction) or electrode No 4 immediately above (5.5 mm) the squamocolumnar junction was less than or equal to the minimum pH recorded in the three most proximal oesophageal electrodes; and (2) the pH recorded simultaneously in the four more distal intragastric electrodes (electrodes Nos 8, 9, 10 and 11; ie, 3.85–8.05 cm distal to the squamocolumnar junction) was greater than or equal to the minimum pH of the acidic oesophageal refluxate. Reflux that did not fulfil both the above criteria was deemed to be of indeterminate intragastric source. Statistical analysis was performed using one-sample Wilcoxon test, Mann–Whitney U test or Kruskall–Wallis analysis of variance, unless specified otherwise. Results are given as medians and ranges unless otherwise specified. The study was approved by the North Glasgow University NHS Trust Ethics Committee. All subjects participating gave written informed consent. Intragastric acidity during the fasting period was found to be high, except for the electrodes situated within the cardia. The median %time pH<4 recorded by the electrodes 27–110.5 mm distal to the squamocolumnar junction was high (94–100%). Electrode No 5 situated 5.5 mm distal to the squamocolumnar junction recorded minimal acidity (median %time pH<4 = 2.25%) which was significantly lower than the acidity recorded in all other intragastric electrodes (p<0.05). Electrode No 6 situated 16.5 mm distal to the squamocolumnar junction recorded significantly less acidity (median %time pH<4 = 39%) than more distally situated electrodes Nos. 8–12 (median %time pH<4 = 98.85–100%) (p<0.05). In the first 15 min after completion of the meal, the greatest acidity (median %time pH<4) was at electrode No 6 (7.8%) located 16.5 mm distal to the squamocolumnar junction (fig 2). The electrodes immediately proximal and distal to electrode No 6 also showed a small amount of acidity at this time; this included electrode No 5 closest to the squamocolumnar junction (median = 2.5%) and electrode No 7 located 27.5 mm distal to the squamocolumnar junction (median = 1.7%). The other intragastric electrodes showed a median %time pH<4 = 0 during the first 15 min period except for the most distal intragastric electrode (5.1%). Regional differences in acidity during the fasting period and in response to the meal. Values are median percentage time at pH <4. The median duration of the meal was 15 min. For clarity, shaded figures indicate a median percentage time at pH <4 of >5%. *Different from the value recorded at the same site at 0–15 min after the meal (p<0.05). **In the first 15 min after the meal, different from the value recorded by electrode No 6 (p<0.05). Over the following five 15 min periods, the acidity at electrode No 6 located 16.5 mm distal to the squamocolumnar junction increased progressively to reach 91.4% at 75–90 min. Electrode No 7 located 27.5 mm distal to the squamocolumnar junction showed a similar progressive increase, reaching 79% at 75–90 min. Electrode No 5 located 5.5 mm distal to the squamocolumnar junction also showed an increase, reaching a maximum of 58% at 60–75 min. The most distal electrode (No 12) also recorded increasing acidity, giving a high reading at 30–45 min (42%) and at 75–90 min (38%). In contrast, very little acidity was recorded by the intermediate electrodes (Nos 8, 9 and 10) throughout the entire 90 min postprandial period, never recording a median acidity greater than 3% (fig 2). The electrode (No 5) situated in the cardia 5.5 mm distal to the squamocolumnar junction differed from all the other intragastric electrodes both during fasting and in its response to the meal. During fasting, minimal acidity (pH<4 = 2.2%) was recorded by electrode No 5, whereas high intragastric acidity (39–100%) was recorded by each more distal electrode (fig 2). Electrode No 5 also differed from all other intragastric electrodes in recording a marked increase in acidity in response to the meal, with median %time pH<4 being 37, 30, 58 and 25% during the 15 min periods from 30 to 90 min following the meal (p<0.038 vs fasting). In contrast, all of the other intragastric electrodes demonstrated a highly significant decrease in acidity relative to their fasting state (p<0.05 electrodes Nos 7–12) except for electrode No 6 which showed no significant change in acidity in response to the meal. Oesophageal acidity was greater during the total 90 min postprandial period than during the fasting period for each of the oesophageal electrodes. The median %time pH<4 for fasting versus postprandial was 0% vs 2.5%, p<0.005; 0% vs 1.2%, p<0.005; 0% vs 0.6%, p<0.005; and 0% vs 0.1%, p<0.05 for the electrodes situated at 5.5, 16.5, 27.5 and 61.5 mm above the squamocolumnar junction, respectively. In order to determine whether the proximal acid pocket was a source of significant postprandial acid reflux, the pH of the oesophageal refluxate was compared with simultaneous recordings from different regions of the stomach. For this we only included the three more proximal oesophageal electrodes which were all at least 16.5 mm proximal to the squamocolumnar junction. A reflux event was defined as a pH<4 recorded by any of these electrodes. Eighty-four postprandial reflux episodes in total were identified in the 15 healthy subjects. A total of 51.1% (range 0–100%) of postprandial reflux occurred at a time when the only region of the stomach of equivalent or lower pH was in the cardia within 27.5 mm of the squamocolumnar junction (table 1). This demonstrates that a minimum of 51.1% of the reflux observed had originated entirely from the acidic cardia region. Our methodology does not allow us to determine the intragastric source of the other 48.9% of reflux observed. Reflux recorded from both of these sources extended at least 16.5 mm above the squamocolumnar junction. We compared the characteristics of the reflux events which could only be attributed to the acid pocket with those of undetermined origin. The median nadir pH of the former (pH 1.99) was higher than the latter (pH 1.58) (p<0.005) and the median duration of the former (9.8 s) was shorter than the latter (17.7 s) (p<0.05) (table 2). There was a trend for the former to extend less proximally up the oesophagus, but this did not reach statistical significance (table 2). 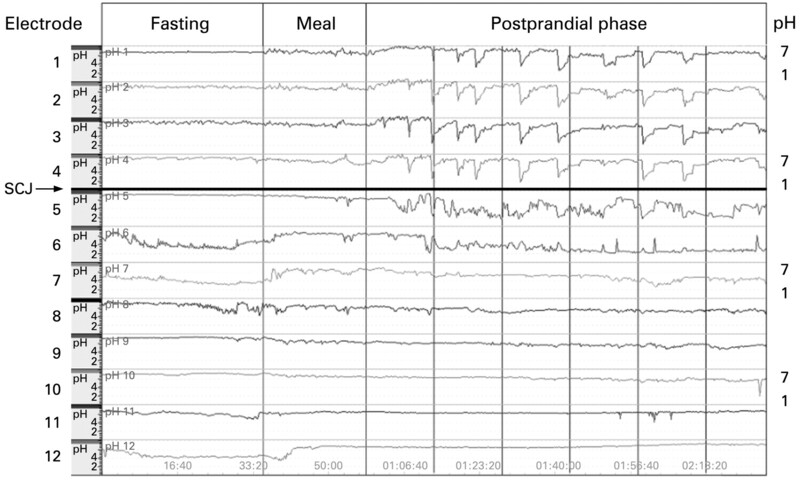 The real-time recording of luminal pH over the fasting and postprandial period allowed close observation of dynamic changes in both the oesophagus and stomach (fig 3A–F). Figure 3E demonstrates oesophageal acid reflux originating from the acid pocket in one of the subjects during the postprandial period. Figure 4 illustrates how the cardia changes from having a neutral pH during fasting to becoming constantly highly acidic throughout the postprandial period and being a source of acidic postprandial oesophageal reflux. Surface contour plots (each 120 s duration) of high definition 12-electrode pHmetry. (A) The fasting state with marked intragastric acidity. (B) At 3 min after completion of the meal, intragastric buffering by the ingested meal is seen. (C) At 17 min after the meal the emergence of the acid pocket at the gastro-oesophageal junction is seen. (D) At 43.5 min after the meal the enlarging acid pocket is demonstrated. (E) At 47.5 min after the meal an acidic reflux episode (circled) from the acid pocket is seen with simultaneous distal intragastric buffering. (F) At 73.5 min after the meal both the proximal acid pocket and distal acidity are recorded simultaneously. SCJ, squamocolumnar junction. 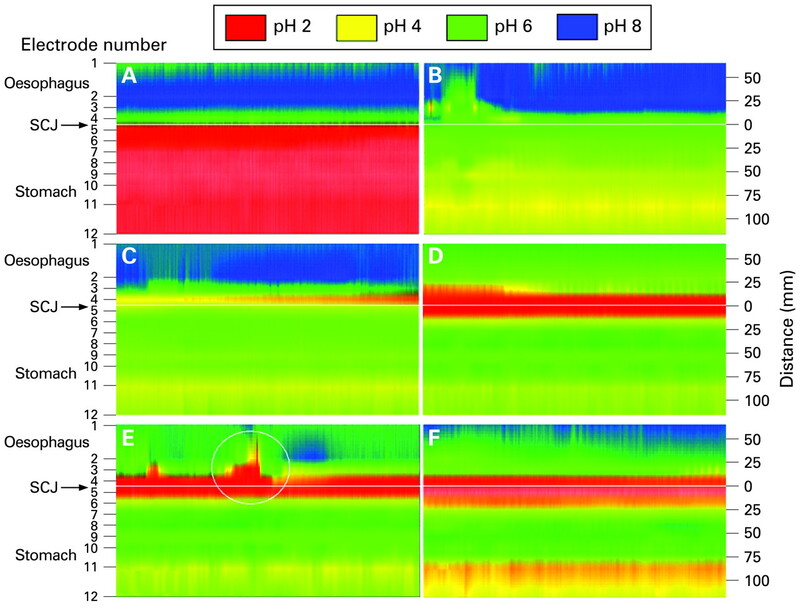 High resolution 12-electrode pHmetry of a healthy subject demonstrating proximal migration of pH step-up in the postprandial phase with acidification of the cardia and postprandial reflux episodes from the proximal acid pocket. SCJ, squamocolumnar junction. This study, employing high definition oesophago-gastric pHmetry, demonstrates for the first time that the cardia region closest to the squamocolumnar junction is a unique intragastric region in recording minimal acidity under fasting conditions but becoming highly acidic following the meal. This acidification of the cardia is a source of postprandial acidic reflux. During fasting, the acidity (median %time pH<4) recorded by the six more distal intragastric electrodes was high (94–100%). However, the degree of acidity was less in the cardia, being 39% at 16.5 mm and 2.2% at 5.5 mm distal to the squamocolumnar junction. Several mechanisms may explain this less marked acidity immediately distal to the squamocolumnar junction under fasting conditions. The gastric cardia mucosa extends a variable distance (0–15 mm) from the squamocolumnar junction to the oxyntic mucosa of the body of the stomach and it contains few or no acid-secreting parietal cells.2 In addition, the lumen of the cardia is usually closed as it is contained within the abdominal segment of the lower oesophageal sphincter. Consequently, the pH of the cardia mucosa will be near neutral as its mucosa does not secrete acid and the sphincter will occlude the acid secreted by the adjacent oxyntic mucosa. The neutralising effect of swallowed saliva may also lessen acidity in the proximal stomach. The fact that the most distal intragastric electrode (No 12) also showed relatively little buffering has been reported previously by ourselves and others.9 15 The explanation for the high postprandial acidity recorded by the most distal electrode is unclear but might be related to its location relative to the oxyntic mucosa of the stomach. During fluoroscopic screening we have observed that the distal tip of this probe usually lies in close proximity to the wall of the greater curve of the stomach (unpublished observation). The two electrodes showing little buffering are thus both near the wall of the stomach; electrode No 6 near the wall of the proximal stomach and electrode No 12 near the wall of the opposite side of the stomach. As acid is secreted by the wall of the stomach, with the food occupying the lumen, the electrodes nearest the wall are likely to be exposed to most acid and least buffering. This effect would also be consistent with the change in intragastric acidity over the 90 min postprandial period when the acidity progressively increased at electrodes Nos 6 and 12 and with time also increased at electrodes Nos 7 and 11 which would be the next electrodes nearest the acid-secreting wall of the stomach. The unbuffered acid pocket might therefore be to some extent an unbuffered “acid coat” if viewed in three dimensions. A paradoxical acid response to the ingestion of the meal was observed in the gastric cardia. The electrode 5.5 mm distal to the squamocolumnar junction recorded minimal acidity during fasting (2.2%) and showed a marked increase in acidity in response to the meal (58% at 60–75 min). The electrode in the distal cardia 16.5 mm distal to the squamocolumnar junction showed a tendency to increased acidity following the meal, but this did not reach statistical significance. In contrast, all the other intragastric electrodes showed an initial and persistent squamocolumnar reduced acidity throughout the 90 min postprandial period. An example of cardia acidification following the meal is shown in fig 4. What is the explanation for the electrode located in the cardia, 5.5 mm distal to the squamocolumnar junction, changing from reading minimal acidity under fasting conditions to reading high acidity during the postprandial period? The lack of acidity under fasting conditions may be explained by being within the distal segment of the lower oesophageal sphincter which is covered by non-acid-secreting cardia mucosa and where the pressure of the sphincter occludes the highly acidic gastric juice secreted immediately distal to it. The marked increase in acidity following the meal might be explained by opening of this distal segment of the sphincter allowing acid to move proximally onto the mucosa of the cardia region. Our group has previously observed loss of the distal segment of the lower oesophageal sphincter following a meal using a manometry pull-through technique10 16 and the pH step-up point moving closer to and even across the squamocolumnar junction with the pH pull-through technique following meals in healthy subjects and reflux patients.9 10 Such a phenomenon was postulated some years ago by Oberg and DeMeester.17 18 An additional or alternative explanation for the apparent rise in acidity in the cardia following a meal relates to previous reports that this region largely escapes the buffering effect of the meal. If the cardia is stimulated to secrete acid by ingestion of a meal but is not buffered by the meal, then its acidity will increase. In contrast, in the rest of the stomach, the meal’s buffering effect more than counteracts the increased acid secretion, causing a reduction in the acidity. It should be emphasised that this acidification of the cardia following the meal extends the concept of the uniqueness of the cardia. It has been previously reported that the cardia differs from the rest of the stomach by not becoming less acidic following a meal and this was attributed to it escaping the buffering effect of the meal. However, the current studies extend the previous work by showing for the first time that the cardia actually becomes markedly more acidic following a meal. Though the subjects studied were healthy volunteers, they showed variable degrees of gastro-oesophageal reflux during the study. We defined oesophageal acid reflux as that reaching the electrodes at least “16.5 mm” proximal to the squamocolumnar junction so as to exclude any effects of proximal migration of the pH step-up as discussed above. Oesophageal acid reflux was greater during the postprandial versus fasting period, consistent with previous observations of provocation of reflux by meal ingestion.19–27 We assessed whether the region of acidity close to the squamocolumnar junction might be a source of this postprandial acid reflux. Our analysis indicated that 51.1% of the reflux episodes occurred at a time when the only recorded region of the stomach with a pH as low as that of the oesophageal refluxate was the gastric cardia. This is consistent with this region containing a finite amount of acid able to travel up the oesophagus and change the pH several centimetres above it. Previous work by Pandolfino et al12 had suggested that the cardia may be a source of postprandial reflux using Bravo capsules clipped just distal to the squamocolumnar junction. We have demonstrated this phenomenon in real time using our static high definition pH catheter (fig 3E). As stated in the Subjects and methods section, all our studies were performed in the semi-recumbent position to ensure uniformity of recordings between subjects. One potential limitation of this technique is that it does not explore the effects of postural change on these regional changes in pH after the meal and may require further studies to clarify this point in future. There were no obvious differences in the studies performed on the H pylori-positive versus negative subjects. However, the study was not designed to examine differences between these two groups and therefore statistical comparison between H pylori-positive and negative patients cannot be made in our report but may warrant future study. This study was partly funded by an unrestricted grant from Astra-Zeneca, Sweden.
. Unraveling the mystery of the gastroesophageal junction: a pathologist’s perspective. Am J Gastroenterol 2005;100:1853–67.
. Histology of the gastroesophageal junction: an autopsy study. Am J Surg Pathol 2000;24:402–9.
. The changing incidence of oesophageal and gastric adenocarcinoma by anatomic sub-site. Aliment Pharmacol Ther 2007;25:447–53.
. Site distribution of oesophagogastric cancer. J Clin Pathol 2002;55:191–4.
. Screening for Barrett’s esophagus in colonoscopy patients with and without heartburn. Gastroenterology 2003;125:1670–7.
. Prevalence of Barrett’s esophagus in asymptomatic individuals. Gastroenterology 2002;123:461–7.
. On the existence and location of cardiac mucosa: an autopsy study in embryos, fetuses, and infants. Gut 2003;52:791–6.
. Unbuffered highly acidic gastric juice exists at the gastroesophageal junction after a meal. Gastroenterology 2001;121:775–83.
. Severe reflux disease is associated with an enlarged unbuffered proximal gastric acid pocket. Gut 2008;57:292–7.
. Acidity surrounding the squamocolumnar junction in GERD patients: “acid pocket” versus “acid film”. Am J Gastroenterol 2007;102:2633–41.
. Bravo capsule placement in the gastric cardia: a novel method for analysis of proximal stomach acid environment. Am J Gastroenterol 2005;100:1721–7.
. The effect of rabeprazole on regional gastric acidity and the postprandial cardia/gastro-oesophageal junction acid layer in normal subjects: a randomized, double-blind, placebo-controlled study. Aliment Pharmacol Ther 2005;21:1321–30.
. Regional postprandial differences in pH within the stomach and gastroesophageal junction. Dig Dis Sci 2005;50:2276–85.
. Postprandial stomach contents have multiple acid layers. J Clin Gastroenterol 2006;40:612–7.
. Nitrogenous chemicals generated from acidification of saliva influence transient lower oesophageal sphincter relaxations. Scand J Gastroenterol 2007:1–9.
. Inflammation and specialized intestinal metaplasia of cardiac mucosa is a manifestation of gastroesophageal reflux disease. Ann Surg 1997;226:522–30.
. Gastric pathology as an initiator and potentiator of gastroesophageal reflux disease. Dis Esophagus 1997;10:1–8.
. Provocation of transient lower esophageal sphincter relaxations by meals in patients with symptomatic gastroesophageal reflux. Dig Dis Sci 1991;36:1034–9.
. Relationship between postprandial esophageal acid exposure and meal volume and fat content. Dig Dis Sci 1996;41:926–30.
. Chocolate and heartburn: evidence of increased esophageal acid exposure after chocolate ingestion. Am J Gastroenterol 1988;83:633–6.
. Gastric distention: a mechanism for postprandial gastroesophageal reflux. Gastroenterology 1985;89:779–84.
. Inhibition of the lower oesophageal sphincter by fat—a mechanism for fatty food intolerance. Gut 1973;14:270–4.
. A comparison of high and low fat meals on postprandial esophageal acid exposure. Am J Gastroenterol 1989;84:782–6.
. Mechanisms of gastroesophageal reflux in ambulant healthy human subjects. Gastroenterology 1995;108:83–91.
. Mechanisms of gastroesophageal reflux in patients with reflux esophagitis. N Engl J Med 1982;307:1547–52.
. Mechanisms of gastroesophageal reflux in recumbent asymptomatic human subjects. J Clin Invest 1980;65:256–67. Ethics approval: The study was approved by the North Glasgow University NHS Trust Ethics Committee.